The news below is outdated. Joe Satriani and his band played the Roseland theater in Portland on Jan 11th, our ASC's Chris Klein went up for the show. 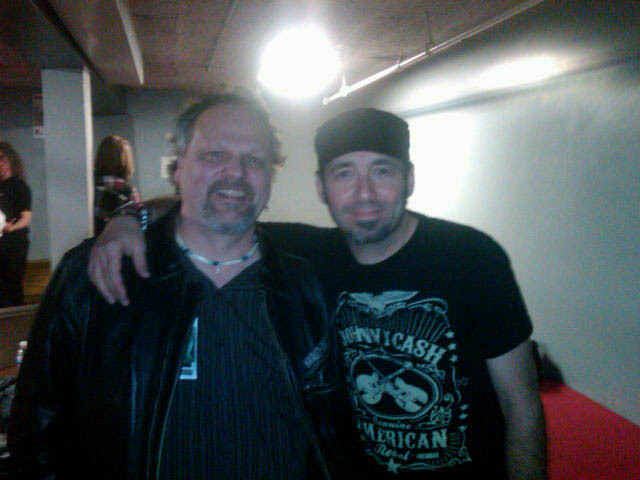 Here he is backstage with avid long time TubeTrap user and endorser Jeff Campitelli, Joe's drummer. Jeff was named one of Rock and Roll's top 50 drummers by Rolling Stone Magazine. Jeff has recorded with TubeTraps since 1995. There are lots of questionable acoustic products on the market, but TubeTraps are the real deal"
This was the 4th of Bruce's present series of mentoring workshops: "In The Studio with Bruce Swedien" is a comprehensive one week "reprogramming" course for recording engineers who come from all over the world. They hope to discover and take home some of Bruce's technical tricks but who they meet is an engineer who does not even use compressors, limiters or EQ and who never even tries to fix it in the mix. He's a sound recording artist who does his mixing at the mic. And that's just the beginning. Bruce's mentoring classes are a rare, life changing opportunity for studio engineers to relearn how to approach their work in recording from one of the true and great Master Engineers in recording history. 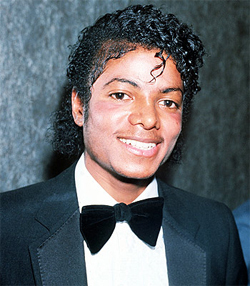 It is with profound grief that ASC thanks Michael Jackson for all he has done for both the music world and the world in general, promoting a message of peace and love. Mr. Jackson is perhaps the most famous musician ever to use ASC-TubeTraps to record every vocal track on every album he has made since Bad. 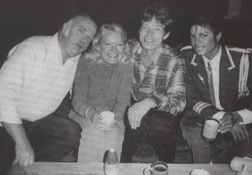 Bruce Swedien, the five time Grammy winning sound engineer who worked with Jackson for many years, even used ASC-TubeTraps to record the sound of Jackson's dance moves while he laid down tracks in the studio. 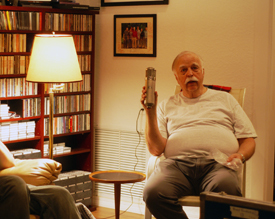 In a 2005 interview with Geraldo Rivera, Jackson chose ASC-TubeTraps as the backdrop. ASC extends their deepest condolences to the Jackson family, his friends and his fans. We are saddened to hear the news of Ed McMahon's passing, and our hearts go out to his friends and family. 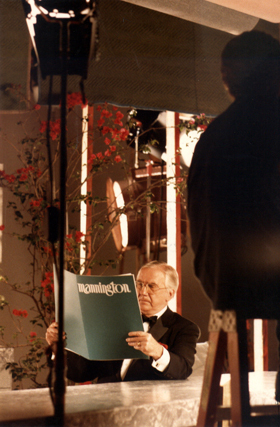 Just a few short years after ASC opened its doors, ASC TubeTraps were used by Director Bill White for a commercial starring Mr. McMahon. 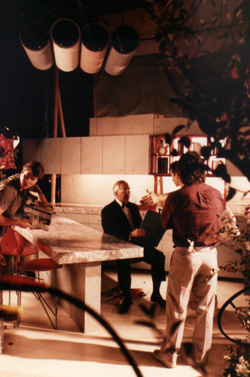 The TV commercial (third reel in) was for Mannington Floors, and used an ASC QSF cloud (suspended TubeTrap array) to help direct vertical sound reflections toward the mic. Note the improved audio of that particular commercial compared to the others. The article by Mr. Noxon, entitled "The Many Voices of NRC, Why All Ratings Are Not the Same", appeared in the Winter issue of Interior Construction. 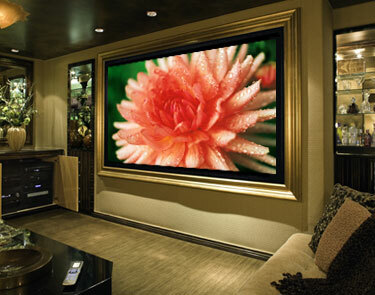 "High volume rooms tend to have a lot of hard, sound reflecting surfaces and at the same time hold lots of people. The architectural ceiling and wall systems specified for these rooms are intended not only to deliver aesthetic value to the room, but additionally to deliver acoustic properties to the room." 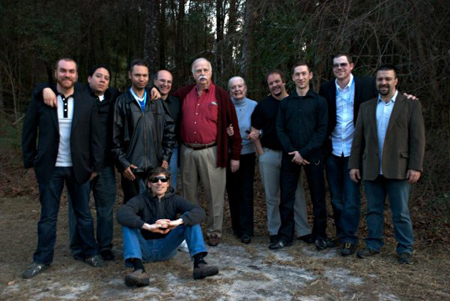 Arthur Noxon joined 5 time Grammy Award winning Recording Engineer Bruce Swedien to teach advanced recording techniques in a week long class. Course Goal: To enhance your ability to critically analyze musical sounds on a continuing basis as a professional. This master class is designed for those professionally involved in the technical aspects, the performing, and the production of high-quality recorded music. Critical listening is a form of listening that involves analysis, serious thinking and thoughtful judgment. 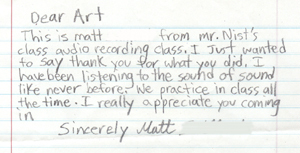 When it comes to recording and mixing music, critical listening is used every day. We will explore all phases of world-class, state-of-the-art music recording right up to and including the final mix. Mr. Noxon spent a day with music students at the New Urban High School in Portland, Oregon. It was highly educational for all involved, as students learned about sound, listening and how the human ear hears. 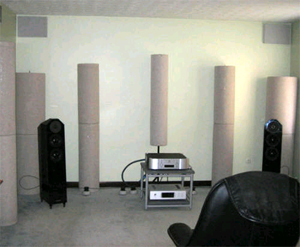 Some of the topics covered basic room acoustics, recording techniques, micing and sound control. 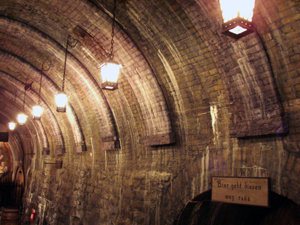 Over 150 years ago, Miller Brewing constructed caves, where Frederick J. Miller used to store his earliest brews. 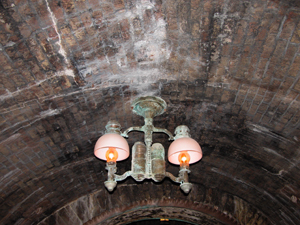 The coolness of the caves helped keep the beer fresh. Miller Brewing recently decided to upgrade some of the caves and use them for a new vistor center and dining venue. However, being actual caves, they had the acoustics one would expect from a cave. 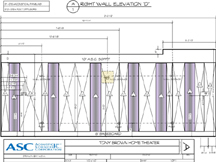 Project designer Jim Logan of Logan Productions, brought in ASC's Arthur Noxon to come up with an acoustics plan that would retain the existing brick look. It was one of Mr. Noxon's most challenging assignments, as dozens of ideas were considered, then rejected by Miller. They insisted on an exact replica of what was already there. Project manager Michael Adams had his hands full as the ASC Design Team pushed the acoustic envelope. Click here for a complete writeup. ASC has been asked to provide the acoustic control package for the upcoming live production of The WHO's Tommy, the ground-breaking rock opera composed by Who guitarist Pete Townshend in 1969. It will be presented for the first time in sonic 3-D via headphones for each and every audience member. 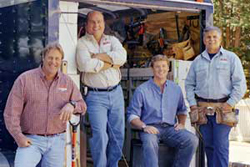 Acoustic Sciences Corporation, home of the TubeTrap, is proud to be a part of the excitement. Recording Studio expert and top sales producer Ty Moyer will be managing ASC's contribution of the world's best acoustic enhancement for the 3-D show. A huge shout-out needs to go to ASC's factory techs who dropped everything, showed up early and worked late to get the rush order out to LA. For more about ASC's sponsorship, Click Here. The L.A. Times rates this show as This Summer's Best in Theater. Here's what they're saying. "A new mounting of the "The Who's Tommy" opened at the Ricardo Montalban Theatre on June 20 for a two-week run. The marvelous Alice Ripley, who was in Des McAnuff's original Broadway production, joins a cast that includes Nona Hendryx as the Acid Queen and Aleks Pevec as Tommy. But what might make the experience unique is the use of 3-D Sound, a new audio system that suggests what really cool Sensurround might be like -- plugged directly into your body." James Johnson (Sound Designer) has created a unique and unprecedented high definition 3 dimensional sound delivery system called exp3d™, which will debut at the show. Mr. Johnsons’ work on Tommy also includes the design of live and recorded 3d sound effects, and supervision of the live audio mix. For more, be sure to visit the Tommy website. ASC was recently called in to help fix a persistent noise issue caused by the building's water heater exhaust vents. The vents, which were quite noisy, had somehow been positioned less than 100 feet away from neighboring residences. When the heating system turned on, the vents created a noise nuisance, and a call was placed to ASC for help. 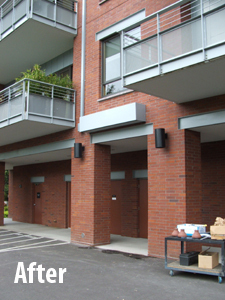 After test data came back, ASC Head Engineer Arthur Noxon determined that a bass trap baffle would fix the problem, and he went to work designing a custom baffle box that would blend into the building architecture. The resulting baffle looks like it was always there, yet the noise has been reduced to a barely detectable hum. 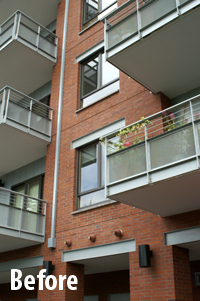 Peace has been restored to the neighborhood, and most importantly, Tate Condominiums is happy with the result. ASC's ace special projects guru Michael Adams is the Project Manager working with ASC President Arthur Noxon to create a custom acoustics package for Miller Brewing. Miller is converting a storage cave at the brewery into a visitor center and museum that will also be used for hosting dinner events. Jim Logan of Logan Productions is designing the project in close consultation with ASC. How do you make a cave sound great? It's not easy, but the great team at ASC dreamed up a unique absorption panel that looks like the original bricks lining the cave walls. When we're done, the cave will look the same, but it will have the intelligibility and the acoustic qualities able to handle dinner guests. 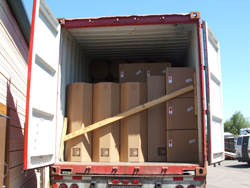 Do you have a project that requires custom acoustics? 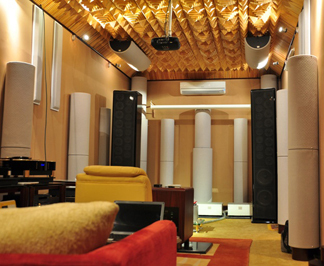 ASC specializes in the engineering and manufacture of unique acoustics. Be sure to visit our Custom Projects page. by Arthur M. Noxon, PE. Originally featured in Church & Worship Technology, March, 2008. ASC has provided acoustics for many churches over the years. Usually, we are called after all else has failed. This article details a church that called ASC first. Mr. Noxon's article is available here. "Usually, working with churches is pretty hard. But one day I got the dream call. It went something like this: Hi. We had some vandals start a fire and our church was smoke damaged. It was covered by insurance and the entire inside of the church needs to be removed and resurfaced. We figure we can use this money to do the acoustic job we always needed, and still get the painting done. So what do we do?" 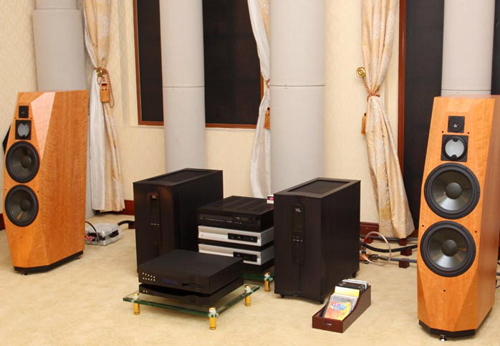 "The dimensions, shape, and features of a listening room can have a profound effect on sound quality, starting with the bass. 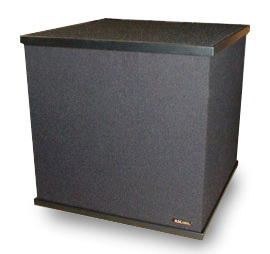 Based on its dimensions and shape, every room has resonant modes or standing wave resonances that either reinforce or attenuate bass frequencies. The most common malady is boomy or heavy bass. And if the bass isn't right, nothing sounds good. Room-resonance modes are present in frequencies from 20 hertz up to about 300 Hz, and they first occur when a sound's wavelength is twice the length of the room. They also occur at twice, three times, and four times the first or fundamental frequency. For example, if a room resonance exists at 48 Hz, a second resonance will exist at 96 Hz, a third at 144 Hz, and so on. The room's width and height also create the own room resonances, and where these resonant frequencies combine, they cause peaks and/or dips in the bass response. 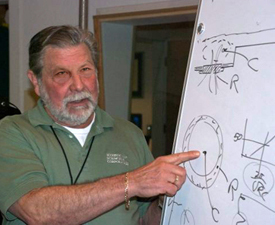 Art Noxon, president of Acoustic Sciences Corporation, a manufacturer of acoustic treatment products, describes the best bass as individual pulses followed by quiet, or intersonic silence. Each bass note should sound distinct; nonetheless, room resonances tend to blur the bass and make all bass notes sound the same." ASC extends a huge congratulations to both Amy Winehouse for "Back to Black" and Herbie Hancock for "River: The Joni Letters" on their Grammy wins. What most people don't realize is that Grammy winner Salaam Remi (one of the engineers for "Back to Black") uses ASC TubeTraps to record, mix or master some of the tracks. Yes, TubeTraps line Mr. Remi's project studio. "LOS ANGELES (Reuters) - British pop singer Amy Winehouse, whose rapid decline into an abyss of drug abuse shocked fans last year, won five Grammy Awards on Sunday after taking a break from rehab to perform at the show from London." Khaliq Glover, aka Khaliq-o-Vision, travelling studio engineer for Herbie Hancock, swears by his ATTACK Wall and QSF. "But jazz veteran Herbie Hancock was the surprise winner of the coveted album of the year award for the all-star Joni Mitchell tribute "River: The Joni Letters," preventing Winehouse from enjoying a historic clean sweep of the top four Grammy prizes." Peter Hylenski is a Broadway Sound Designer. 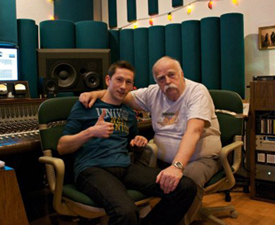 Peter also works as a recording studio engineer for various music, film and commercial projects. Design credits include: Ragtime (West End) Olivier Award nomination – Best Sound Design, Children’s Letters to God, Laughing Room Only, Chef’s Theater, Dora the Explorer – Live! (US National Tour), Scooby-Doo Live! (US National Tour), Ovations! Concerts of Great American Musicals (Chicago Auditorium Theater), Blue’s Clues – Live! (US National Tour), Exactly Like You (York Theatre Company), Spoleto Festival U.S.A. (1999 - 2002 seasons), and Niketown (NYC). What can we say. We’re proud to be allowed in the pit, let along to help voice it. We had to invent a great little self-standing super thick sound panel, with built in diffusion that loves to stand stable against the wall, that is low cost. We used an old technique we used to use for getting half round TubeTraps to stand up against walls. We also sent over 2 sets of StudioTraps. They were going to use them at one end for the drums but we’re glad they learned quickly how to mess around with the Studios to be able to fix the Sax, who got stuck at the other end of the pit. 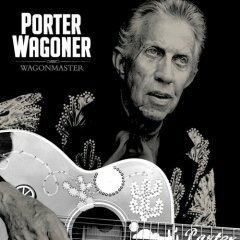 We are sorry to hear that Porter Wagoner passed on yesterday. His name and sound are so familiar. One song in particular from his last album, Wagonmaster, is getting lots of airtime right now. 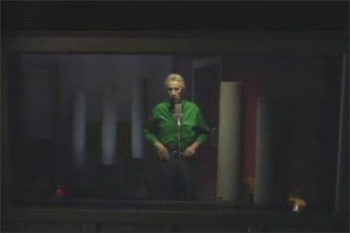 It is “Committed to Parkview” by Johnny Cash and was recorded with Marty Stuart at OMNIsound in Nashville. In the video of the song, he is surrounded by ASC Studio Traps and they are also in photos from the actual recording session. We are very proud to have played even the smallest role in helping to record his voice. Arthur Noxon was recently interviewed for an article in The Register Guard, Eugene, OR. The article is entitle Going for No. 1 for Noise in Autzen Stadium, By Mark Baker. Published: Saturday, October 27, 2007. Mr. Noxon discussed the basics of stadium noise and whether Autzen Stadium, home of the University of Oregon Ducks, could break the record of 126 dB. "Want to break a record today, Duck fans? Then wear rain slickers, despite the forecast of sunny autumn skies." “Sound bounces off plastic,” Noxon says. Rain slickers tend to reflect instead of absorb sound, which increases their loudness, he says. Arthur Noxon was recently interviewed for several soundproofing articles posted on MSN.com. "How to handle noisy neighbors"
"10 tips for finding a quiet apartment"
"Bass, that low boom from your neighbor's stereo, takes a lot of energy to produce. ("Bass waves physically shake the walls," says Arthur Noxon, president of Acoustic Sciences. "It's like you walk up to the wall and double your fist up and hit it.") These low-frequency sound waves are especially hard to combat since they travel far and wide, bending easily around objects." Mr. Noxon discussed soundproofing STC ratings and how this industry standard fails to cover low frequency sound transmission. ASC also hosted a booth at the Eugene Construction Expo 2007 where we had several hands-on WallDamp demonstrations. They were actually more like "ears-on" demonstrations, as we showed the unique damping features of WallDamp. This was a side-by-side wall assembly, one with WallDamp, one without. Participants were invited to tap each assembly with a rubber mallet to hear the difference, which was dramatic to say the least. One side sided like a boing, the other like a dull thud. We'll leave it to you to figure out which was which. Engineer and ASC founder Art Noxon custom designed this product to fit a pair of Tannoy Ellipse 8 monitors. It's much more than a simple nook, because these active tri-amped monitors can pack a punch across a huge bandwidth (40 Hz to 50 kHz). Because of that, the bridge, which spans the lower TubeTrap Monitor Stand and the twin upper TubeTrap tops, has to be acoustically transparent. In addition, the Ellipse 8 includes a top mounted tweeter which has to fit comfortably in the bridge. 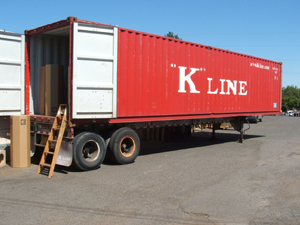 It was a custom job all the way, but ASC handles tasks like this all the time. It was a team effort, involving many talents to get the job done. Shown in the picture is guitarist Buddy Sawyer, whose day job is ASC Shop Manager. Bruce Swedien recently moved and of course, he's building a new Westviking Studio. He's using a steel building that came with his new property as the base structure, and adding a "room within a room" concept to achieve good sound isolation. 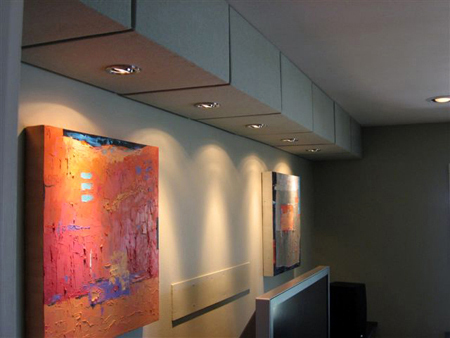 ASC WallDamp is being used extensively throughout the project to damp low frequency sound and calm the walls. Bruce has retained his good friend Art Noxon for all the acoustic engineering and approval of the plans. Now construction is under way, and so far it's looking very impressive. Bruce will be sending in updates, so stay tuned folks. This beautiful home theater used our IsoWall soundproofing system to contain the awsome sound generated by the state-of-the-art gear throughout. Check it out here. ASC engineers worked with designer Mark Haflich to build custom acoustics for his latest project. For a full description, click here. Needless to say, he's thrilled! 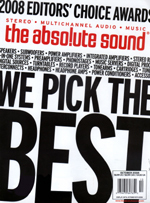 AudioRevolution.com publisher Jerry Del Colliano made final rankings, and ASC TubeTraps were given a #90 spot, as the description credits TubeTraps to “quickly solve evil acoustic problems in your room.” TubeTraps are essential components of any critical listening setup, be it professional recording, music playback, or home theater. 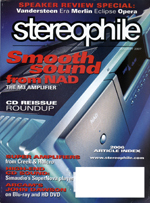 “Think we’re kidding,” says AudioRevolution.com, “try removing them from your room and then do some critical listening." TubeTraps are available direct from ASC, and come in a variety of sizes and fabric styles. 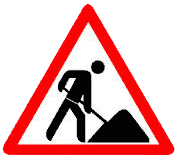 Contact ASC by calling (800) ASC-TUBE, or through this website. To see ASC’s Top 100 ranking, click here. A full review of TubeTraps is also available on the AudioRevolution.com website by clicking here.